Our inspired collection of award-winning illustrators give us their own unique interpretations of Terry Pratchett's phenomal Discworld. Each full-page illustration also appears on the back; there are biographies of the artists as well as the author on the inside front page. The calendar dates are exhaustively researched and include major real-time calendrical data for the UK, Australia, New Zealand, Canada and the United States. Artists briefed include: Edward Miller, Les Edwards, Sandy Nightingale, Jackie Morris, David Frankland, David Wyatt, and, of course, Paul Kidby, Terry Pratchett's favourite portrayer of the Discworld.Terry Pratchett himself has chosen some of his favourite scenes to be illustrated. 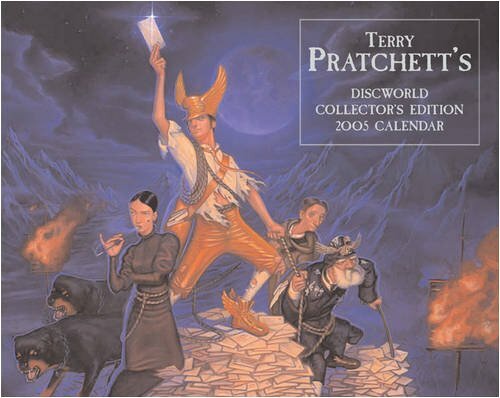 The only time the cover for the new Discworld novel is seen in its entirety, as the artist intended. Terry Pratchett lives in Wiltshire. His Discworld series is a publishing phenomenon; he won the Carnegie Award for the Discworld novel MAURICE AND HIS AMAZING EDUCATED RODENTS. He was made an OBE in 1998.